Downtown Lake Orion combines a unique and historic central business district with a commercial corridor that extends south along M-24. The Village of Lake Orion contains important historic residential and commercial architecture, and was designated as a National Register Historic District as of 2006. Downtown is a destination for numerous annual events, with nearby services, shopping, restaurants and entertainment. Historic neighborhoods along the northeast boundary of the core downtown and lakefront add to Downtown Lake Orion’s distinct sense of place. 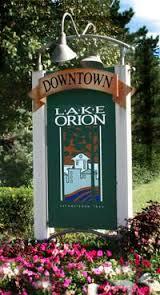 Downtown Lake Orion hosts art festivals and small concerts for the community in its local parks. Dragon on the Lake is an especially important festival that takes place annually downtown where locals celebrate our village’s history with art and music. The Village of Lake Orion even has its own Farmer’s Market downtown. Here, the community can support the local food system and buy produce that was picked within 24 hours or less. Our Lake Orion Farmer’s Market offers the ability to interact with farmers face to face. Organized runs, tree lighting and the annual Holiday Lighted Parade are also some events that take place within this community.